Beef Stroganoff is one of those dishes that remind me of my childhood. 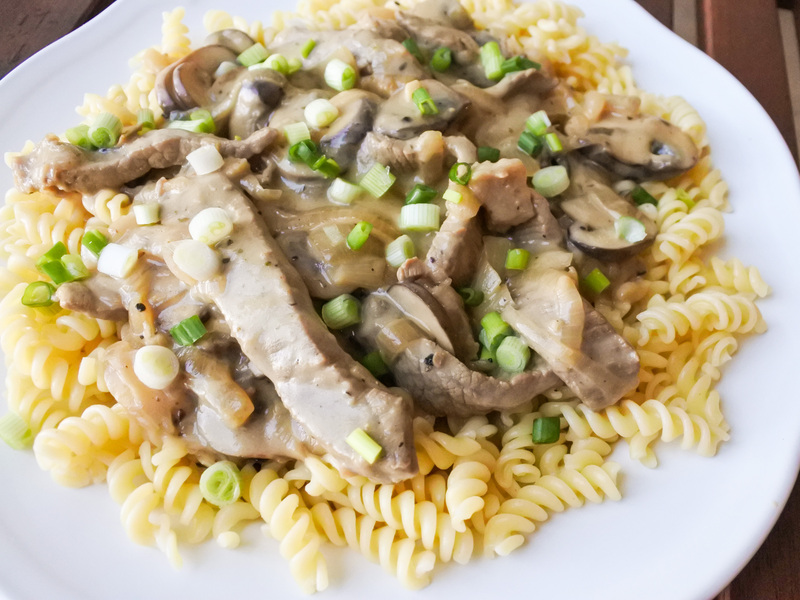 The tender beef, the succulent mushrooms all in a creamy sauce over a pile of egg noodles. The only problem with trying to recreate it now is that my mother made her delicious stroganoff with a touch of dill, the ‘hate it or leave it’ herb that I’m actually quite fond of. My husband however, is NYET! So, what’s a cook to do except to just experiment with what works. For me, a touch of dried marjoram does the trick nicely. Add this to the onions, mushrooms and beef with a touch of sherry and sour cream and you’ve got a dish that satisfies my cravings and pleases the rest of the family too. Not to mention that stroganoff doesn’t take nearly as much time as one would think. Pair it with egg noodles, mashed potatoes or steamed rice and you’ve got yourself a family meal ready in no time. Slice steak into strips as thin as you can get it. Sprinkle with salt and pepper and let marinate in cooking wine for 20 min. Meanwhile, slice onions, garlic, shallots and mushrooms. Saute onions, shallots and garlic in butter over medium heat until soft. Add sliced mushrooms and cook for 3-5 minutes until just beginning to brown. Add dried marjoram and stir. Cook for an addition 3-5 minutes until mushrooms are good and browned. Turn heat to high and add sliced steak and wine. Cook until most of the wine has evaporated. About 1-2 minutes. Reduce to heat to low, cover and cook for 10 minutes. Add 1 TBSP of Dijon mustard. Stir and cook for a minute or so. Add sour cream, stir, cook for a minute or so then turn off heat and serve. If you find it is a little too thin for you liking, simply add 2 tsp of cornstarch mixed with 2 tbsp of water to the sauce and let bubble for a minute or so until thickened. Goes well over egg noodles, steamed rice or mashed potatoes. Meanwhile, slice onions, garlic, shallots and mushrooms. Saute onions, shallots and garlic in butter over medium heat until soft. Add sliced mushrooms and cook for 3-5 minutes until just beginning to brown. Add dried marjoram and stir. Cook for an addition 3-5 minutes until mushrooms are good and browned. Turn heat to high and add sliced steak and wine. Cook until most of the wine has evaporated. About 1-2 minutes. Add beef broth, bring to a boil Reduce to heat to low, cover and cook for 10 minutes. Add 1 TBSP of Dijon mustard. Stir and cook for a minute or so. Add sour cream, stir, cook for a minute or so then turn off heat and serve. If you find it is a little too thin for you liking, simply add 2 tsp of cornstarch mixed with 2 tbsp of water to the sauce and let bubble for a minute or so until thickened.